I went into hospital on 21st April at 7:30am, got changed into my gown, but didn't get to go into Theatre until 2:30pm. In the Anaesthetic room they inserted a small needle into my lower back to numb the area before putting the main Epidural needle in. This made me feel a little sick for a few minutes but was otherwise ok. It didn't, however, numb my lower limbs very much. They tilted me to one side to get it to flow into one leg, but I could still raise my leg and could feel cold spray on my leg. They put a tourniquet on, which was quite painful to be honest, but bearable. They agreed to put a local into my knee as well to supplement the epidural which the anaesthetist was pretty puzzled as to why it wasn't in full effect! I could still feel the local needle go into my knee too. However after that, I didn't feel the cut and the endoscope camera go in, and then they switched the monitor on for me to see what was going on inside. Overall they said my knee didn't look too bad for someone who did a lot of running. I did feel the knife go in the opposite side of my knee. It actually hurt and made me wince, so they gave me another local on that side and inserted the probe. They tested various areas to locate the damage. 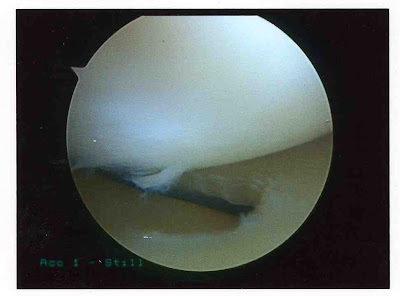 The surgeon cut out a small part of my meniscus. You can see an image captured see below (there is a chunk missing now, at the bottom). That black line is a vein or an artery, ignore that. Additionally he was testing the "bounce" of the cartilage and found that the lower half was too soft (compared to the top which was firm) and had too much "give", which could also be giving me additional symptoms. So he basically pushed the probe through the cartilage a few times, effectively making holes. He said this would cause it to bleed underneath and effectively "glue" it back together and make it stronger. This procedure wasn't planned originally, but anything to get me back to normal I was happy with. After that they quickly patched me up, dressed my leg and I was back out in the recovery room, the whole procedure probably only took 15 minutes. Back in the recovery room the Epidural really took hold and came into full effect. I could feel nothing from the waist down. It seems it took a long time to have full effect. I was then sent back to the ward and allowed to have some tea and toast, after an 18 hour fast! I felt a little strange, but otherwise not too bad. By 6pm I still had no feeling, so I had to stay in overnight. I had to have a catheta fitted as I was bursting to go to the loo, but had no control to do so! The only saving grace was that I couldn't feel it being put in. I had it done once, 9 years ago, when I could feel it and it is not an experience I can recommend! I didn't sleep that well on the ward as there were other patients who were, well, disoriented and noisy for most of the night. The next day I could feel my legs again, and so after the physio had seen me I was discharged. I couldn't put much weight on the left leg, so they gave me a crutch which I used for 2 days. I've been taking Ibuprofen and Cocodamol for pain relief since. I have now removed the bandage and changed the dressing. I think I expected to find a couple of stitches in the holes either side of my kneecap, but no, just slits which did open up when I changed the dressing. Hopefully they will have dried up and sealed now, but I have not checked since. I think I'll take another look tomorrow afternoon, and maybe put a new dressing on. My kneecap is very sore still, but I am walking ok over short distances. I think it will be a couple more weeks before I am walking again more or less normally. I have a physio appointment in 2 weeks and I have a set of daily exercises to do in the meantime. The surgeon told me not to run for 6-8 weeks until I go back to see him, so I am going to have a frustrating time drying to get back running, but I will take his advice. I'll just have to find something interesting to write on here for 6 weeks in the interim! I am relieved to get the surgery over, and I just hope it cures the problems. Now I'm off to put my feet up some more.